Happy 2016! I am one of those people who is obsessed with the dawning of a new year and all of the promise it brings. New projects! New trips! New seasons of fave telly shows (Girls Season 5 what what! Only 48 days away!)! And of course, with the new year comes new food – probably the best promise of them all for someone like me who enjoys bumbling around in the kitchen. I look forward to developing and sharing new recipes with you as much as I look forward to discovering what crazy shenanigans Hannah and the gang have gotten themselves into this year (supes excited for Girls Season 5 and the excuse to order HBO for a few months, as you can tell). The new year should be ushered in with a recipe that is bright and fresh and earthy and tangy – and that preferably goes well with leftover champagne. And that vibes well with any health-related resolutions we may have set. This citrusy feta and parsley beet salad checks all those boxes, in my humble opinion. Until about a month or two ago, I pretty much thought I found beets repulsive. I’d used (a.k.a. hidden) them in various baking projects – chocolate beet cupcakes, garlic beet bread – the summer before last when the CSA I was involved in burdened me with them on several occasions. Pureed and added to such recipes in relatively small amounts, the beets added an earthy undertone that I appreciated but didn’t feel a desire to become more directly acquainted with. But my non-desire to eat a beet in non-pureed, non-hidden form preceded that. 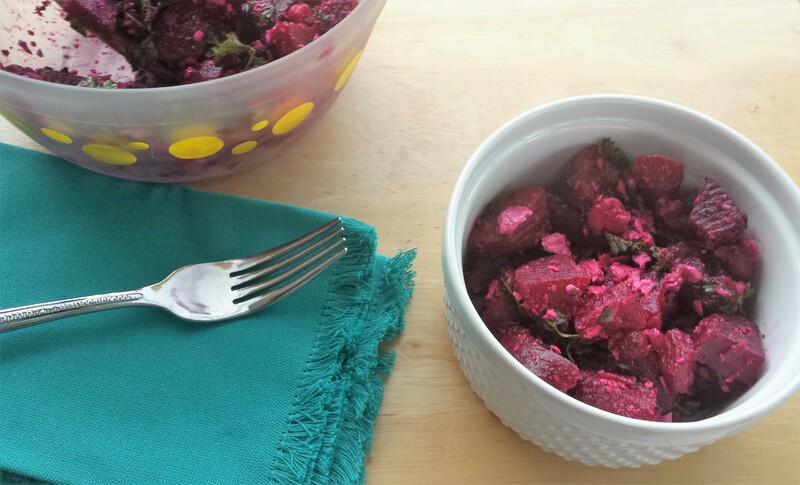 In childhood, I became well acquainted with the gelatinous sheen of the chunks of pickled beet studding the Greek salads my mom religiously ate during our many visits to National Coney Island restaurants. While I hold rosy memories of the many lunch dates I had as a kid at several locations of this beloved Detroit-area chain, the thick, neon-purple slabs of beet on my mother’s favorite salad always looked downright gross to my young eyes. But hey, they say time can heal all wounds – so why not childhood aversions to vegetables? 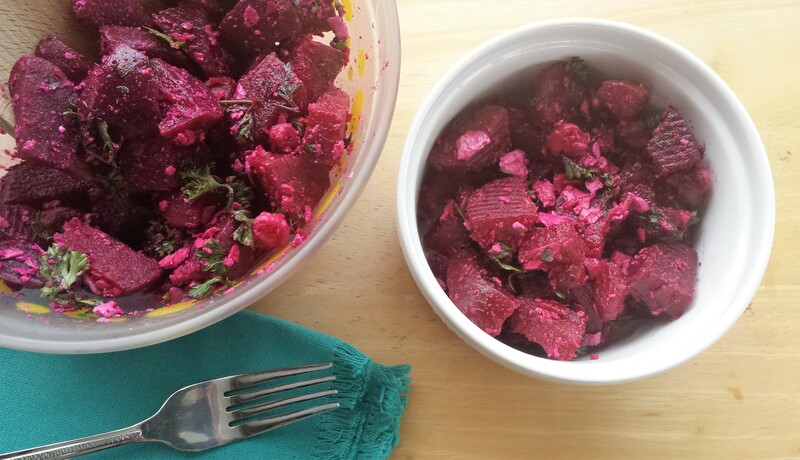 When chilly weather reemerged this year, along with my enthusiasm for all of the lovely seasonal root produce on display at my local market, I had a desire to give beets another shot. Surprising, but I went with it. I roasted them and sliced them and ate them in the first draft of this salad (which was actually then intended as a savory pastry filling) – and gee whiz! actually liked them! Roasted, they have a much milder taste than I expected them to have; in fact, I’ve found their subtly combined flavors of earthy and sweet repeatedly remind me of the taste of a good ear of corn – a random but pleasant association. 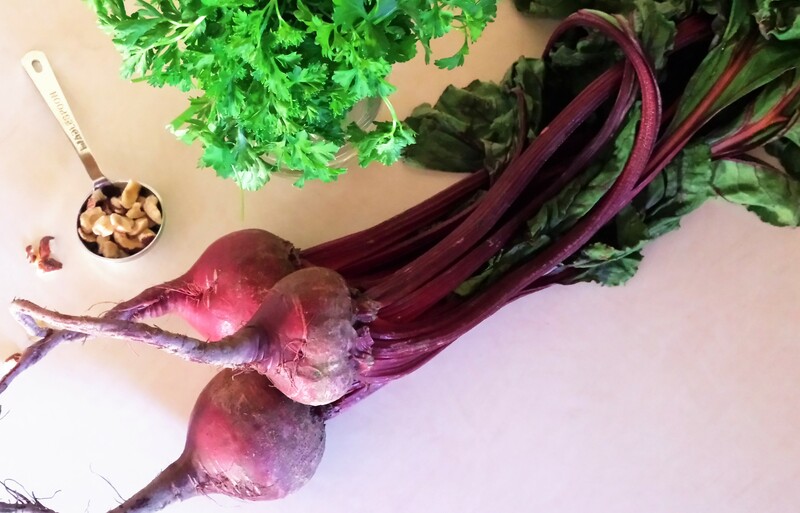 Not only are beet surprisingly delicious, but they are also loaded with great-for-you fiber and vitamins and minerals, such as vitamin C, potassium, and manganese. Hooray! Preheat oven to 400 degrees. Remove the tops from the beets and scrub beets well. Wrap each one individually in foil, add to a baking dish, and roast until they are soft when pierced with a fork, about 50-60 minutes. Let them cool, then rub the skin off of each one (it should come off easily). Chop into chunks, then toss with the parsley, hazelnuts, feta, lime juice, salt, and pepper. Can serve immediately or let chill first for an hour per your preference. Makes three to four servings.